Sono Barbara. I am Barbara. As you may have guessed, I am a teacher. But before being a teacher, I am above else a passionate extrovert, eclectic, wide-ranging, receptive and curious person. Since I was young, I have loved three things (in no particular order): Food, books and the sea. Perhaps more than these, I must include art, traditions, cinema, literature, history, castles, architecture . . . I like knowing and I like helping people to know my culture. It is for this reason that I chose my line of work. I teach the Italian language and the Italian culture – a complex job, but one that I adore. I was born and grew up in San Severino Marche, going on to study in Urbino, Rome, Siena, and Macerata. Loving history, historical documents, and libraries, I worked as an archivist for several years. However, in 2006 I took a shot in the dark. I went back to studying and everything changed. From that point, I have been an Italian teacher. Since 2012 I have lived in England, first in London and now in Kent. Thus I await you here with Time to be Italian! 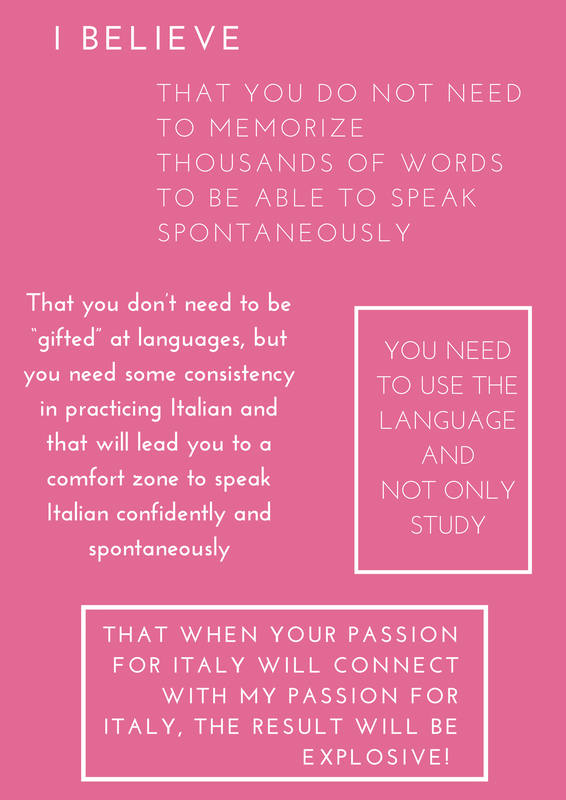 At time to be Italian, you can have a full immersion into the Italian language and culture! I will help you to speak spontaneously, and I will give you an immersive environment until your next time with Italians or in Italy!